Director – Tod Browning, Screenplay – Guy Endore & Bernard Schubert, Photography (b&w) – James Wong Howe, Art Direction – Cedric Gibbons. Production Company – MGM. In a Hungarian village, wealthy Sir Karell Borodin is found dead, drained of blood and with two puncture marks at the neck. The superstitious villagers put this down to vampires. Police and a local professor lead an investigation into the vampires, which appear to be inhabiting a nearby castle. The vampires now prey on others in the village and set their next target as Borodin’s daughter. Mark of the Vampire is commonly considered one of the horror classics of the 1930s. It was made by Tod Browning, a cult director who previously made the Bela Lugosi Dracula (1931) and the infamous Freaks (1932), as well as a number of silent classics with the great Lon Chaney [Sr] during the 1920s. (See below for Tod Browning’s other genre films). In fact, Mark of the Vampire is a remake of a silent film that Tod Browning had previously made with Lon Chaney, London After Midnight (1927), which alas is a lost film today. This version starred Bela Lugosi who was then riding on the success of Dracula. It also featured nineteen year-old Carol Borland, an actress who was still remembered for this part over sixty years later despite having no lines and never making another film for nearly fifty years. 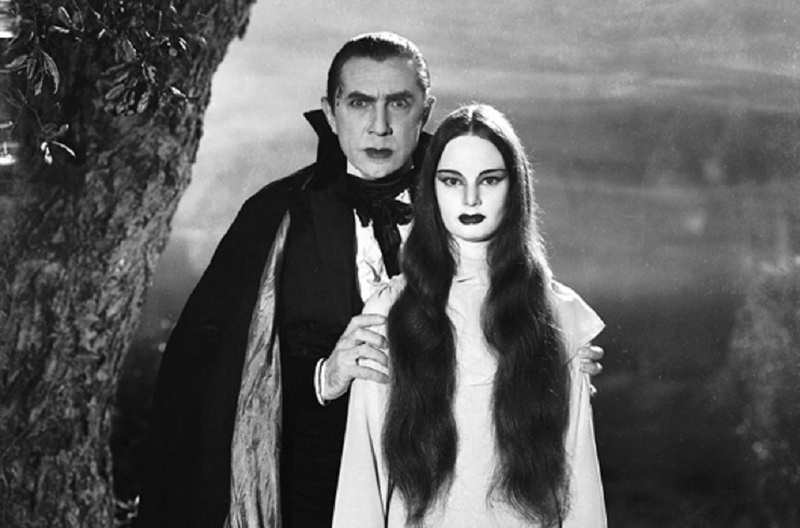 (It was Borland that also provided the template for the female vampire and Charles Addams who later borrowed her appearance for the look of Morticia Addams). In many regards, Mark of the Vampire is a better film than Dracula, even if it remains wholly in Dracula‘s shadow. Certainly, Tod Browning demonstrates more flair for atmosphere here than he did on Dracula with eerie shots of Bela Lugosi forming out of a cloud of mist or Carol Borland flying on bat wings. On the other hand, Mark of the Vampire is also talky and static, not unlike a stage play (also one of the problems that Dracula had). As the professor, Lionel Barrymore (whose brother was the grandfather of Drew) gives a performance filled with distractingly doddery mannerisms that becomes immensely irritating. Unfortunately, what ruins Mark of the Vampire as a potential classic is a ridiculous twist ending that [PLOT SPOILERS] mundanely reveals the vampires to be part of a scheme staged by the police to catch a killer. The scheme is absolutely preposterous. How, for instance, are they able to stage the effect of a man transforming into a bat out of mist? Why is there even the need for such an elaborate deception involving vampires when the real scheme is undone by hypnosis – why not just hypnotise the subject right from the start? The one thing this emphasise is just how much the great horror boom of the 1930s and 40s was one where filmmakers felt entirely uncomfortable with the supernatural – there were almost no supernatural horror films made during this period, and films that did start that way, such as The Beast with Five Fingers (1946), invariably revealed the supernatural to be mundane in origin. Director Tod Browning’s other genre films are:– the extraordinarily perverse love and amputation story The Unknown (1927), London After Midnight (1927), Dracula (1931), the classic Freaks (1932) and the miniaturised people film The Devil-Doll (1936).